The UK is home to a number of different species of birds of prey, coming in all sorts of colours, shapes and sizes. The question is, do you know each one from the next? 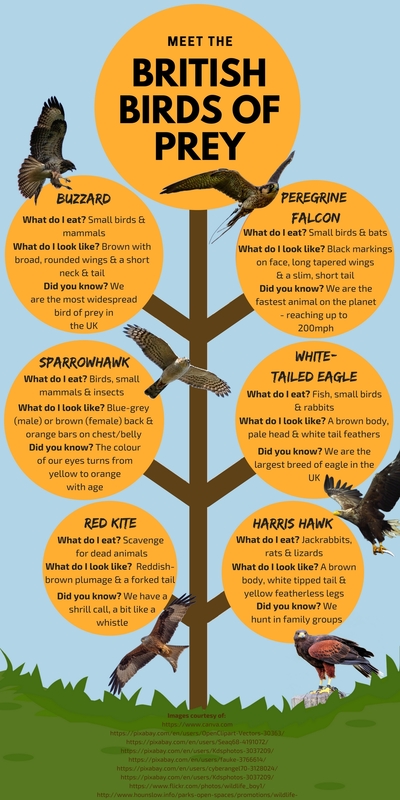 For those who aren’t as clued up on their British birds of prey as they’d like to be, we’ve put together a handy guide to make your bird spotting that bit easier! Fancy becoming familiar with them in real life? We have a whole range of birds of prey experiences where you can get up close and personal with your favourite feathered friends! As the most widespread bird of prey in the UK, buzzards can be spotted in almost every county, though they are most common in Scotland, Wales and the Lake District. They like almost all habitats including woodland, moorland, villages and, in recent years, have even been sighted in towns and cities on occasion. Large in size, buzzards are usually brown and vary in shade from a rich chocolate to much paler variations. Broad rounded wings are recognisable by their dark tips and finely barred tails, and you’ll often see buzzards gliding with wings held in a shallow ‘V’ shape and tail fanned majestically. Their diet includes a mixture of other birds, small mammals and, when prey is in short supply, earth worms. Most commonly found in the south-west of the United States, Chile and central Argentina, Harris hawks aren’t native to the UK. However, the species is increasingly being sighted across Britain, after escaping from falconry centres and private owners. The most commonly used species in falconry due to their nature, they are sociable animals and you can generally fly more than one of them at the same time. Nicknamed the ‘Wolf of the Sky’, these hawks hunt in family groups, which allow them to gang up on and capture larger prey than they would otherwise, including jackrabbits, rats and lizards. They boast dark brown and chestnut plumage, white-tipped tails, large broad wings and long, yellow un-feathered legs. See the Harris hawks in action on one of our exciting Falconry experiences, which include unique opportunities to handle the birds and learn how to fly them, with help from expert hawk handlers. Those who live in built-up areas are most likely to sight peregrine falcons of all of the British birds of prey, as the most widespread species in the world, they are happy to nest in almost any habitat, including bridges and skyscrapers in major cities. Formidable hunters, they are renowned for capturing their prey (small birds) in mid-flight – sometimes reaching speeds of up to 200mph, making them the fastest animal in the world! Peregrine falcons are very distinctive and can be recognised by their black heads, with markings that look like a bit like a droopy moustache. Other distinguishable features include a bluish-grey back, a cream flecked chest, broad pointed wings and a relatively short tail. Once close to extinction in the UK due to loss of habitat, the red kite has successfully been reintroduced to many parts of the nation, thanks to one of the world’s longest running protection programmes. The striking bird is unmistakable thanks to its deep red plumage, grey face, angled black-tipped wings and a deeply forked tail. Though very graceful, their shrill call could be mistaken for a whistle or a child’s high pitched yell. Unlike other species, red kites pair for life and live in all sorts of habitats from woodlands to rough pastures, where they build large messy nests out of twigs in the forks of trees. As a scavenger, a red kite’s primary source of food is carrion, but they will also hunt for small mammals, birds and worms. The sparrowhawk is one of the most common birds of prey in Britain and a solitary creature, only coming together with others to mate in the spring and early summer months. Adapted to hunting small birds in confined spaces like woodland, they can often be spotted vying for prey in gardens and urban areas. They are quite small in size, with piercing yellow eyes and rounded wings. As with a lot of birds of prey species, the females are larger than the males – adult males can be recognised by a bluish-grey back and wings and orangey-brown bars on their chest and belly, while females and young birds are identified by a brown back and wings, and brown bars underneath. Sparrowhawks mainly eat small birds and are ambush hunters, using the element of surprise to catch their prey of birds, small mammals and insects. The white tailed eagle was made extinct in the UK during the early 20th century due to illegal killing, but it has successfully been reintroduced to the nation and can now mainly be found residing close to large bodies of water and coastlines in remote parts of Scotland and the Scottish Isles. As the largest of the British birds of prey, the sizeable raptor stands at an impressive one metre in height and has a wing span of a vast two and a half metres! With brown body plumage, a white-tailed eagle can be identified by its pale (white on older birds) head, neck and tail feathers and in flight, they boast broad wings with fingered feathers and a short wedge-shaped tail. These fierce birds generally feed on fish, which they pluck from the water with their talons and eat mid-flight. Like the red kite, they mate for life and return to the same territory each year to do so. Those interested in seeing the eagles up close can make a day of it with this eagle handling experience, followed by a tasty spread of tea and cake.